Does Watching TV Too Long Hurt Your Eyesight? There have been multiple speculations that watching TV too long or too much hurts your eyesight. This article is all about myth busting and solving and researching rumors that people have said to be true. This article confirms that watching TV too closely or too long cannot permanently damage your eyesight. Although it cannot cause permanent damage there is still the chance of a minor headache or tired eyes. This was just a myth that many people believe to have been true as well as myself. My mother always used to tell me if I watch TV too much it will cause damage to my eyes. I’m not sure if she was just trying to scare me or if she actually thought it was true. According to this ophthalmology article watching TV too close wont cause damage to your eyes but if being watched in the dark it can cause eyestrain. Eyestrain can be as small and simple as blurred vision or just simple pain around the eyes. It is said to be more of a child habit that we eventually grow out of. There is no evidence of this being true so scientists must call it a myth. This entry was posted in Uncategorized on December 2, 2016 by Anthony Frank Trobiano. 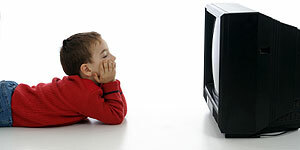 This article is very interesting because there have been numerous times where I will watch the TV very close and for a long time, and nothing will happen; other times i sit there for maybe 20 minutes and my eye starts to hurt. it is interesting to see that the eyes start to strain when the lights are off. There have been numerous times when I turn off the light in the room and begin to watch TV, and my eyes start to hurt for no reason at all! I find that after prolonged use of a computer or watching tv my eyes can start to water up and sting. I really hope that the study you found is right, but I found this article on why eyes begin to hurt after watching too much TV. This is an ironic comment to make, but I haven’t noticed how much I missed television until I came to college without my tv. I never was a glued to the screen type of person, but when I did watch tv I remember having to refocus my eyes sometimes. I do believe that watching tv too long or being on my laptop for long periods of time effects my eyesight, even with my glasses on.